Greetings from Australia! I've been here for the past three weeks, (with one more to go! ), with Belinda Carlisle! Every performance on this tour has been sold out! Huge thanks to all the Australian fans that have come to the shows! Just checking in! I't's been a while since I've updated here! I'm in the process of re-designing my website and hopefully soon it will be completed. In general things have been very good! A few recent highlights/happenings : I just finished a summer tour with Belinda Carlisle of the Go-Go's, doing some fun shows with Tony Award winner John Lloyd Young of "Jersey Boys", I've been in the studio with singer-songwriter, Shawn James. Also... excited to mention....I'm now preparing for an upcoming run of September shows in Japan with "Gospels of Judas", very excited and looking forward to this. "Gospels of Judas", debut record on Warner Bros. Japan has recently been released, I recorded drums on some of this record and I am eager to play this music in front of audiences with my HIMURO band mate YT! Thank you for your time and reading! Hope everyone is doing good! I wanted to share some of the things I've been up to recently with you. Thank you for your time and support! As most of you know, for some time now I have had the privilege to work with the great Japanese artist Kyosuke Himuro. We have done many tours and recordings together over the years and last year it was an honor to be invited to participate in the epic and historic Kyosuke Himuro #LastGigs tour. We played baseball stadiums all over Japan, finishing with 3 nights at the Tokyo Dome. Himuro's fans are incredibly gracious and inspiring to play for and the band and crew are like a family to me. It's hard to put into words the powerful energy of these shows and how grateful I am to have been included in the experience. Extremely proud of all the work we have done. A thank you & arigato to all Himuro fans for your continued warmth and support! Below is a preview of the tour film, which in addition to dvd/blu-ray release, will also be shown at theaters all over Japan later this month. James Blunt's latest single, "Bartender" has been released! I contributed drums to this track as well as the song, "Over", off his newest album, "The Afterlove". It was great to be back in the studio with James. Also, a little while back, I got the opportunity to record with the legendary rock band Foreigner. It was an honor to play drums for new versions of 2 of their songs, "The Flame Still Burns", and "I Don't Want to Live Without You". These tracks are included on their upcoming 40th anniversary collection entitled, "40", which comes out later this month. In February I did some touring with Belinda Carlisle of the Go-Go's, it always fun going out on the road with her and the band. Some of the concerts we did on that run were part of, "The 80's Cruise". Below is a clip of the Go's Go's classics, "Our Lips Are Sealed", & "Vacation", from one of the performances on the ship. I'm looking forward to doing some more shows with Belinda later this summer! I recorded drums for Colin Hay's new record, "Fierce Mercy". There is something very special about this collection of songs, perhaps one of my favorite records I've been a part of thus far. There is a pure, beautiful and honest sentiment permeating through these recordings. This album feature a cast of talented musicians from all over and I am incredibly happy for its release. Please check out "Fierce Mercy" below and if you are not already familiar with Colin's post Men at Work solo albums, I encourage you to delve into his extensive catalog. I spent the later part of 2016 overseas on the road with Japanese rock and roll icon, Eikichi Yazawa. We did a sold out two month tour of Japan culminating with a five night stand at the historic venue, Nippon Budokan. For more info on Yazawa : https://en.wikipedia.org/wiki/Eikichi_Yazawa. Last year, I recorded drums for the Madden NFL 17 commercial featuring Ron Gronkowski. Other recent happenings: I played a few shows in the US with Smash Mouth including performances at the Alamo Dome in San Antonio, TX for Big League Weekend and the Auto Club Speed Way in Fontana, CA for NASCAR. Later this month, I am looking forward to performing with John Lloyd Young (of Jersey Boys). Greetings from Tokyo! Just a quick check-in here! I have been in Japan the past few weeks rehearsing for the sold out KYOSUKE HIMURO #LASTGIGS Dome Tour. In just a couple days we will play the first of two shows in Osaka. We then go to Fukuoka, Nagoya, and culminate with 3 nights at the Tokyo Dome. I am happy to announce Himuro's latest record, "L'EPILOGUE", which I played drums on, is the number one album in Japan! Thank you Himuro for including me on the journey! Just a week before I flew to Japan, I was in Australia on tour with the great Colin Hay, (of Men at Work). We had a fantastic run of shows, including headlining the Port Fairy Folk Festival and the Blue Mountains Music Festival, shows at the Melbourne Zoo and Sydney Zoo, Lizzottes in New Castle and many others. I hope to return to AU soon! Also, we have been in the studio working on Colin's next record. Below is a clip of the drum solo and last chorus of the Men at Work classic, "Down Under", live in Australia from our recent tour. (If you look closely you may see a little dancing from Colin!). I spent some time at Ocean Studios in Burbank with Austin based singer songwriter, Shawnee Kilgore and Writer/Director Joss Whedon, (The Avengers/Buffy the Vampire Slayer), on a colborative project they are working on. Great to lay down some tracks with them and my friend Eric Holden on Bass. Sara Watkins is featured on fiddle and vocals on some of these songs. Excited to hear this one! In February I was invited to take part in the 25th anniversary concert of Cecilia Noel & the Wild Clams at Catalina Bar and Grill in Los Angeles. I consider The Wild Clams a musical institution and feel it's an honor to perform as a part of that ensemble. Musicians performing that night included, Jimmy Earl, Mitchito Sanchez, Alan Deremo, Jeff Babko, Toshi Yanagi, Kevin Ricard, Cleto Escobedo III, Munyungo Jackson, Richie Gajate Garcia, Bernie Dresel, Greg Bisonette, Fred Kron, San Miguel Perez and Yosmel Motejo....just to name a few! A great night! I continue to play around LA with Tony Award winner, John Lloyd Young, (Jersey Boys). I always look forward to playing John and the band which consists of the monster duo of Tommy Faragher (Musical Direction and keyboards) and Davey Faragher on Bass. Speaking of Tommy, I had the pleasure of recording drums for a movie he scored, the animated short, "Follow You Heart". Included on this soundtrack is a song featuring Lucinda Williams, "It Hurts Me Too". Davey Faragher played bass and Marcus Watkins played guitar. "Follow Your Heart", is curently being screened at various film festivals right now. Thank you Tommy! Below is a teaser for the film. Follow Your Heart | Official Teaser from Inklings Creative on Vimeo. Alright everyone! Thank you all for the support! Hope you are all doing well, just a little update. Here are some of the things that have been happening the past few months as well as some upcoming stuff. Thanks! Coming up in late August I will be on tour for a couple of weeks playing drums with Go-Go's front woman, Belinda Carlisle, on her dates in the US and Canada. Looking forward to this! Sat 09/12/15 Indio, CA Fantasy Springs Resort Casino & Special Events Ctr. A little while back I was asked to be a part of a project titled, Stars Beyond, featuring Gary Beers (of Inxs) on Bass, Cirian Gribban (of Inxs) on Vocals, Alain Whyte (Morissey) on Guitar, Michael Krompass (Smash Mouth, Nelly Furtado) on Guitar, Mike Farrel (Alanis Morrisette, Richie Sanbora) on Keys, Heather Jeanette (Kelly Clarkson, Selena Gomez) on Vocals and myself on drums. We recently spent some time in the studio and shot a promo video at the El Rey Theater in Los Angeles. A few months ago I accompanied Tony Award winning singer John Llyod Young, (Jersey Boys), as part of an amazing trio with musical director Tommy Faragher on piano and the mighty Davey Faragher, (Elvis Costello/Cracker), on bass. We will be performing again August, 10th at Sterling's Upstairs in Los Angeles. I just completed recording some drum tracks for Kenyan singer-songwriter, Eric Wainaina. These sessions were produced by my friend Will Kennedy. We recorded these at Dave Bianco's studio "Daves Room". I have been recording and playing around Los Angeles with Cecilia Noel and the Wild Clams. This band is an honor and thrill to be a part of. Her line up often includes musicians such as, Albert Wing (from Frank Zappa's Band) and Jimmy Earl (Jimmy Kimmel Live/Chick Corea), as well as my fellow Colin Hay band mates, Yosmel Montego and San Miguel Perez and host of other talented musicians and singers. We will be playing at the Baked Potato in Los Angeles, Friday August, 14th. Thanks for stopping by! Hope 2015 is going well for you all so far! Here's a little update of what has been happening as well as a wrap up of the last half of 2014. I spent most of 2014 in Japan with Kyosuke Himuro. We Completed a massive sold out 51 date tour of Japan commencing with 2 nights at Yokohama Stadium. This tour marked Himuro's 25th anniversary of being a solo artist. The Yokohama dates were documented on dvd/blu ray. Here are some clips from Night One. I am currently in the middle of a 50 date tour of Japan with Kyosuke Himuro. Just announced....Eight shows have been added to the Kyosuke Himuro 25th Anniversary Tour including 2 days at Yokohama Stadium, July 19 and 20! In addition, I was recently in the studio with Himuro recording some new songs for an upcoming release. Rhythm and Drums Magazine Japan did a piece on myself and the gear I am currently using on the road in the May 2014 issue. Thank you Rhythm and Drums Magazine Japan! Thank you Sakae Drums, Paiste Cymbals and Vic Firth Drum Sticks for your support and making such fine instruments! Mylene! The Timeless 2013 DVD/Blueray has been released! It documents last year's epic Mylene Farmer Timeless tour that I participated in. Sakae Drums! I received an opportunity to visit the Sakae drums factory in Osaka a few weeks ago where I was allowed to build a snare drum of my choice (with the help and aide of the talented Sakae drums craftsmen and staff!). Thank you to all at Sakae Drums for the warmth and hospitality. I was happy to see once again how these beautiful drums are made and to be reminded of the heart and soul that goes into these handcrafted instruments. Below is pic of me applying a coat of paint to the shell. Hello Everybody! Here's to a happy and healthy New Year! My best to you, your families and friends. I am looking forward to a great 2014. I feel very fortunate to have gotten the chance to make a lot of music all over the world in 2013..... To all of the fans of the various artists I work with, thank you for coming to the performances and making it all happen. ありがとうございます! Merci! Thanks! Spasibo!.....To all of the Artists, Bands, Musicians and Crew I work with, thank you for having me up there with you!.....To Sakae Drums, Paiste Cymbals, and Vic Firth Drumsticks for making the instruments I rely on, I thank you! Here is some news about what's in store for this year as well as some highlights of the second half of 2013. I am excited to announce that this year I will be taking part in the KYOSUKE HIMURO 25th Anniversary Tour! Excited to come back to Japan and perform with HIMURO and the band for all the fans! You can hear and see my playing on HIMURO's latest cd/dvd, "25th Anniversary Best Album Greatest Anthology". This past year I got the opportunity to take part in the dream that was the Mylène Farmer "TIMELESS Tour". It was a supreme joy to share the stage with such a dedicated cast and crew, band, staff, dancers and to perform for all of the fans. Thank you for the support of all who took part and attended in person and spirit. Below is the live video for the first single, "Diabolique Mon Ange" from the recently released live album, "Timeless 2013". I was interviewed for the November 2013 issue of BATTERIE Magazine (French Drum Magazine). Thank you Batterie for the article! Last year I performed with Smash Mouth on most of the, "Under The Sun Tour". What a blast it was traveling through North America with Sugar Ray, Gin Blossoms, Verticle Horizon and Fast Ball! Special thanks to our hard working crew who brought the whole spectacle to life 6 days a week for about two straight months, and a thank you to the boys in Smash Mouth for letting me have a solo in the middle of our show. This was a real highlight of 2013! I had the opportunity to play some additional Hi-Hats on the song, "Bones" from James Blunts new record, "Moon Landing". It was great to be back in the studio with James and Tom Rothrock again! The entire record came out great. Below is a clip of the song I worked on. I spent a nice day in the studio last year with the UK's own Scarlette Fever recording the song, "Sunday Best". I had the pleasure of playing with the great Davey Faragher on bass and working with Tommy Faragher who was producing the track. Below is a link to the song. OK everyone, that's all for now! Thanks for checking out this update, and talk to you soon! Hello Everyone! It's been awhile since my last update! Hope you are all doing good! Thanks for stopping by! Here are some of the things that have been happening since then. I had the pleasure of spending New Year's Eve in Japan playing with Himuro 2 sold out nights, Dec 30 and 31st, at Budokan! I have been playing drums for Smash Mouth. We recently got back from a fantastic two week tour of Australia, and have been performing regularly all over the US. This summer we will be touring as part of the Endless Summer tour with Sugar Ray, Gin Blossoms, Vertical Horizon and Fastball. Below is a clip from our recent performance on VH1. Come check it out the show if you are around! In addition, I have done some shows with Five for Fighting and have been in the studio with producer Tom Rothrock, Toots (of Toots and the Maytall's), Samantha Ronson, Katy Rose, producer Jimmy Messer, and Scarlette Fever (UK) with producer Tommy Farargher. Hi everyone! Here's an update for you all! Hope you are all doing good! I'm excitied to say I have been recording drums on some new HIMURO KYOSUKE recordings. Here is a clip of the new single "WARRIORS". Here is a clip of a song entitled "Play Within A Play" from the "GOSPELS of JUDAS" project featuring HIMURO on vocals. This is the b-side to the new single. Here is another new HIMURO song, "ENEMY'S INSIDE" featured in a Japanese Good Year Tire commercial. Another song we recorded, "Bloody Moon", from the "GOSPELS OF JUDAS" project featuring HIMURO, is featured in the new video game "Yakuza 5". Here is a clip with the song in the background. Belinda Carlisle: Last month I had the pleasure of doing some west coast shows with Belinda Carlisle of the Go-Go's. What a fantastic band and crew, a joy to work with. Here is a clip from the San Diego show of us playing "Our Lips are Sealed" and "We Got the Beat". 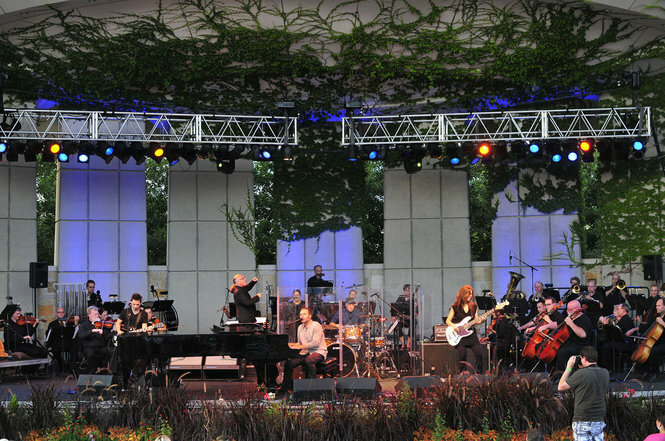 In the past few months I have done some concerts with Five For Fighting including a show in Grand Rapids, Michigan accompanied be a full orchestra. It was great evening of music. A big thank you to all the talented musicians, arrangers and our fantastic conductor Arnie for all of their hard work. Below is a photo from the show. And..... We completed a residency with Samantha Ronson and the Undertakers at the Malibu Inn. Thank you to all who came to the shows! We hope to see you again soon! Below you can stream or download the album "Chasing the Reds" produced by my friend Jimmy Messer. I co-wrote track 7 "Promise" and track 9 "Half Awake (Meltdown)". That's all for now! Take care everybody! Thanks and talk to you soon! Hi Everyone! Here is a video clip from the performance with Meiko on the Tonight Show a few weeks ago! Joe Testa form Vic Firth interviewed me earliar in the year at the NAMM show. Thanks everybody! Take care and best! Recording drums with Kevin Hastings and Will Kennedy for the new Vanity Machine record at East West Studios in Los Angeles. Check it out! Thanks! どうも! Charlie! This is the trailer for the upcoming DVD/Blu-Ray Release of HIMURO'S "2010-2011Rock and Roll Suicide Tour" that I participated in. What a tour! Check it out! Take care! Charlie! Hello everyone! It has been a while since my last update! 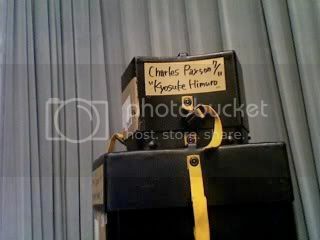 February 2011 marked the end of the Kyosuke Himuro Borderless Tour. 6 months/51 shows!. The DVD comes out later this month. 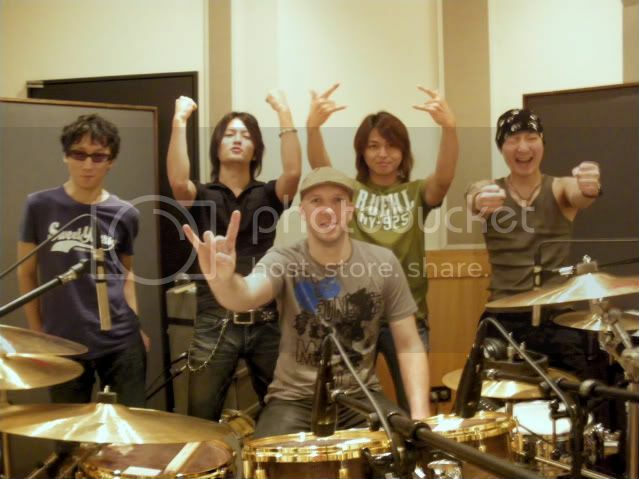 Soon after the tour ended Himuro invited me into the studio to record the benifeit single “If you want”. We have also been working on some recordings for Himuro’s new album. I have been playing and recording with “Samantha Ronson and the Undertakers”. The Album is currently available on Itunes. I co-wrote track 7 “Promise”. Check it out here. http://itunes.apple.com/us/album/chasing-the-reds/id482237630 Here are a couple of songs including the title track "Chasing the Reds"
I have been doing some shows With Five for Fighting and Smash Mouth (subbing for Randy Cooke). Here is a clip of Five for fighting performing at the Heritage Classic in Calgary. I have been playing with Liz Phair. Recently we performed in London. Here is a clip from a show At the Mountain Winery in Northern California. I was in the Studio with Vanguard artist Trevor Hall. Hello Everyone, It's been a while! Here is some of what I've been up to this year! Also, recently I have been doing some T.V. shows and concerts with Enrique Iglesias. Here we are having a BLAST on the George Lopez Show performing Enrique's latest single "I Like It". Check it out! Earliar in the year I recorded Spanish Artist Antonio Carmona's new record. I had the honor of working with Grammy and Emmy award winning producer and composer Gustavo Santaolalla. Here is the video for the first single "Bum Bum". All of March I was touring in Australia with the great Colin Hay (Men at Work) in support of his newest release "American Sunshine". We played all over the country including a very inspired show at the Byron Bay Blues Festival. Colin has a DVD from our 2007 Australian tour "Colin Hay Live at The Corner Hotel" that has just been released. Check out the Trailer! Just a few weeks ago I did a show with Five For Fighting in Chicago! I played on track for my friend producer Tom Rothrock (Beck, James Blunt, Elliot Smith) who has been making some really cool club/house music lately. OK! Big thanks everyone, I'll check into with you soon! Hello Hello Hello! Hope you're all doing great! In a nutshell, this past spring, summer, and fall have been filled with tours and shows with Mylène Farmer, Enrique Iglesias, Rickie Lee Jones, Kyosuke Himuro with Steve Stevens, and Colin Hay. Also, there are some new recordings I am on that I am really excited about! N°5 on Tour - Mylène Farmer . American Sunshine - Colin Hay. With Enrique Iglesias in Lara, Venezuela. All the best! Take Care! Talk you soon! First off, hope everyone is having a great New Year! Some new stuff that I have played on has been released! BINECKS have released there 3rd single "The Sun" featuring HIMURO bandmates Daita (guitar god) and Tessy (computer genuis) check it out! I recorded the debut single for Italian Artist Enricco Bicchi on Sony Italy. This is produced by my good buddy Enrique Gonzales Muller! Happy holidays to everyone! To an amazing 2009 for us all! Health and Happiness for the the new year! ps. for those of you in Japan : NANDEYANEN!!!!!!!!!!!! Thanks! I spent the week before Thanksgiving at Red Star studios recording with Rickie Lee Jones. 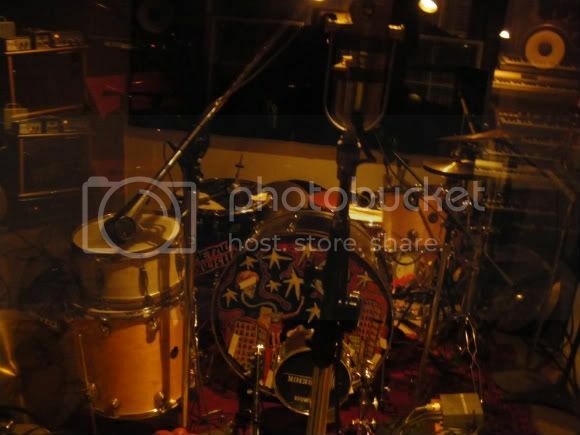 Here is a pic of the drums from some point during the sessions! I hope everyone had a great holiday! I am back in California! The Himuro tour was AWESOME! 3 months in Japan! Great shows, all sold out! Great people, good to see all of those from the 2007 tour again and great to meet new friends as well. Fun times, great shows, amazing food. Thank you to HIMURO, the band, the staff and all of the fans! Hope to see you all again! Coincedentally, the one and only Marie' Digby happened to be in Japan promoting the Japanese release of "Unfold" while I was there! 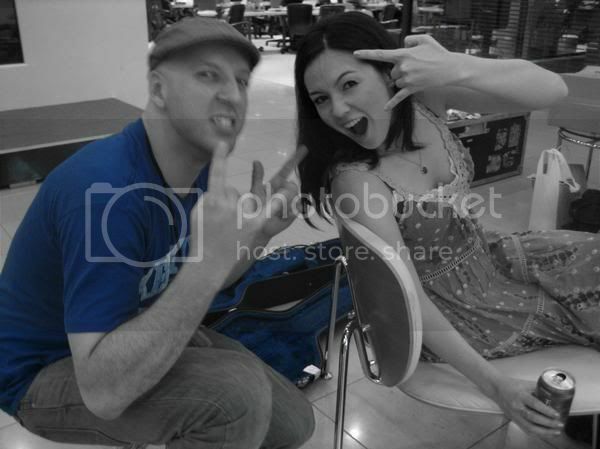 I joined her on percussion for some promotional performances! Also, I have been doing a video diary/update for Paiste Cymbals from japan! Even though I am back, there will still be some more installments from Japan! I miss Japan, but it is good to be back in California! My new e.p. will be done very soon! Also.. very excited, the first show of the HImuro tour almost here! For those of you in Japan, you can hear me on the track "Keep the Faith" on HImuro's new greatest hits collection that was just released. You can also see me on tour with Himuro all over Japan this summer.